Linlithgow Rose striker Colin Strickland has admitted he and his team-mates had expected to win East of Scotland Conference C as they chase down leaders Broxburn Athletic with three matches remaining. 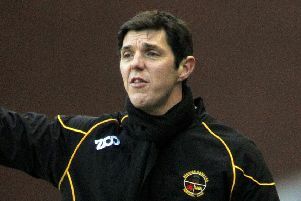 Rose were placed in what was deemed to be the easiest of the three conferences at the beginning of the season, but face an uphill task to win the division and secure a place in the play-off, with Broxburn in pole position as the West Lothian men lead Rose by five points although the Prestonfield club have a game in hand. Their game in hand comes tomorrow when they host Inverkeithing Hillfield Swifts with Broxburn in cup action and Strickland recognises they can only take care of themselves to have any hope with the pressure on them to win their remaining three league matches. He said: “There is pressure on us to win our league games, but there is always pressure at Linlithgow anyway no matter what season it is, or where you are playing; you are expected to win every game. Nothing has really changed from any other time. It is not in ours hands, it is Broxburn’s to lose. “They have two games to play and they will expect to win those two games so it basically their’s to lose. We just have to take care of our fixtures just in case anything does happen, but we would expect them to win their two games. Rose had intense pressure on them to win last weekend, with their Saturday night kick-off as part of GroundHop weekend against Jeanfield Swifts coming after Broxburn had won away to Craigroyston in the afternoon. Strickland, who is out of contract at the end of the campaign and is yet to sit down with manager Mark Bradley to discuss his future, continued: “No matter what league you are in, at Linlithgow you expect to win it at the start of every season. This is one we expected to win. Looking back it is probably the Ormiston game that has killed us – even in the Broxburn game, we should have taken a draw at least because we were winning with five minutes to go and to get beat was a hard one to take. Broxburn are a decent side and they are there on merit. “We feel pressure from the support to win something. I’ve been at the club around nine years, although I had a year away, but there is always pressure to win things. I’m one of the fortunate few that have actually been at the club and been successful, and those nights are good, and we want to get them back at Linlithgow as soon as possible because that is what the club is all about. Elsewhere, Bonnyrigg Rose, who became the first club to win their conference last Friday, continue their bid for further success when they host Lowland League Stirling University in the semi-finals of the SFA South Region Challenge Cup at New Dundas Park, with Hill of Beath facing East Kilbride in the other last four clash.